J/News Articles: St Francis YC "Sailors of the Year"- Two J/105 Sailors! St Francis YC "Sailors of the Year"- Two J/105 Sailors! 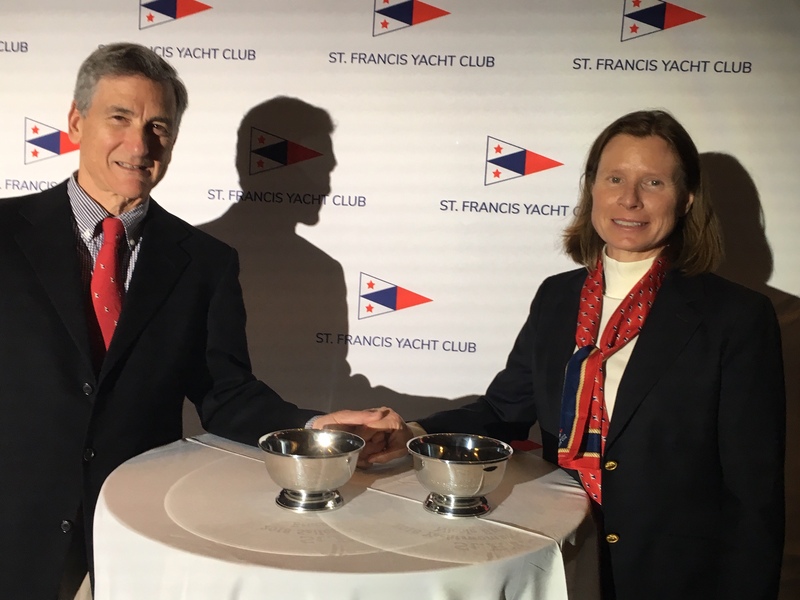 (San Francisco, CA)- The St. Francis Yacht Club Sailor of the Year is a member who, through dedication and persistence, achieved excellence as an amateur skipper and/or crew in the sport of yacht racing. For 2018, the award went to Bruce Stone, a past Rolex Big Boat Series winner, Rolex Block Island Race Week winner, and J/105 North American Champion. In addition to a busy season racking up wins sailing J/105s across the USA, Bruce Stone also chaired the US Match Racing Championship Committee, organized the 2019 Nations Cup Match Racing finals to be held at St Francis YC in April 2019, and continues to chair multiple StFYC regattas. Congratulations Bruce Stone! Coincidentally, it was Bruce’s crew and wife- Nicole Breault- that was awarded the StFYC Yachtswoman of the Year, recognizing her for a woman member’s contribution to the sport of yachting! Nicole continues to be an amazing sailor and supporter of the Club, running learn-to-sail and learn-to-match-race clinics that are getting more women out on the water. In addition to adding to her own podium moments in both match racing and J/105 fleet racing, she’s been an important role model in motivating women to improve their skills and lose their fear of taking responsibility on board. She’s the #1 Woman Match Racer in the USA for the third year in a row, and #6 in the Women’s World Match Racing rankings! She’ll be representing the Club at the 2019 Nations Cup, which will be held at StFYC in April 2019. Congratulations Nicole Breault! Add to Flipboard Magazine.